Compare discounts for Hotels Motels in St. Louis, Missouri! Located just south of where the Missouri river meets the Mississippi, St. Louis Missouri is a historic American city with distinct European flavor and something for everyone. Arts fans will find a large selection to choose from at establishments such as the Fox Theater, Powell Symphony Hall, West Port Playhouse, Muny Opera and several Art Museums. Thrill seekers will find some of the best Mississippi Riverboat Casinos in St. Louis, and sports fans could catch a game at Busch Stadium or the Rams Dome, both world-class venues. Families with children can choose to spend a day at Six Flags St. Louis or visit one of the many other attractions that can interest the little ones, including the St. Louis Zoo, Butterfly House, Magic House, Science Center and the Botanical Gardens. With a thriving downtown, and west side, a modern airport and a world-recognized landmark, St. Louis, 'Gateway to the West' is a world-class destination by its own right. Note: Lists are not identical. 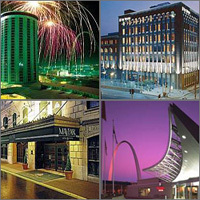 Different sites offer different accommodation options for St. Louis. The Four Points by Sheraton Fairview Heights is a new hotel with a 10,000 sq. ft. conference center, situated 12 Miles east of St. Louis. Marriott's award winning economy hotel lodging chain features clean, convenient, quality accommodation and the peace of mind you get from Marriott consistency - all for a great value. La Quinta Inn St. Louis is conveniently located only minutes from Lambert International Airport and provides convenient access to several popular attractions, including Historic St. Charles and Busch Stadium. The Hampton Inn Westport is located in the suburban community of Maryland heights. The Wingate Inn is located in the Riverport Earth City Area of St. Louis. SpringHill Suites is Marriott's new concept in economy all-suites lodging featuring clean, convenient, quality accommodations including pantry area with refrigerator, microwave, coffee maker and sink, living area with sofa bed and work desk and sleeping area - all for a great value. The Ramada Airport Hazelwood is located in the suburb of Hazelwood, convenient to Lambert International Airport. The Downtown area and its attractions are an easy 20-minute drive from the hotel. TheLa Quinta Inn St. Louis Hazelwood strives to make you feel right at home with a clean room cared for by a friendly staff. TownePlace Suites by Marriott are designed to make you feel at home for a day, a week, a month or more. The hotel designed by business travelers, Courtyard by Marriott surrounds you with all the conveniences that make business and pleasure travel easy. The La Quinta Inn St. Louis Maryland Heights strives to make you feel right at home with a clean room cared for by a friendly staff. The Stratford Inn is a tourist-class hotel located just minutes outside downtown St. Louis and easily accessible off of Hwy 44. The Westin St. Louis is located in the heart of Saint Louis historic Cupples Station area, close to the federal courthouse, pedestrian mall, and the famous Gateway Arch.